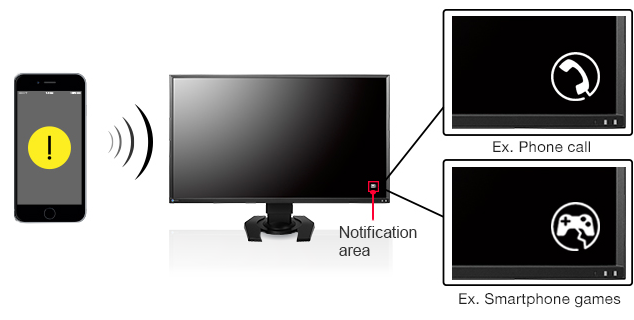 Adjusting your screen's color and other settings usually requires poking around with the buttons on the monitor's bezel. 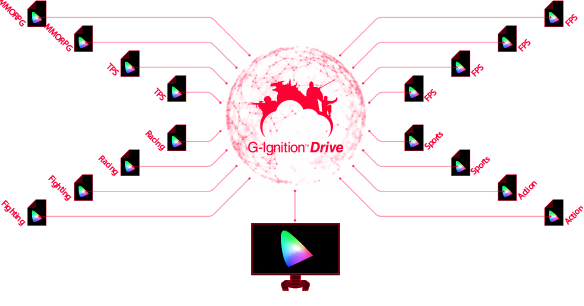 G-Ignition 3.0 simplifies the process by letting you adjust your monitor's color settings and gamma as well as turn Smart Insight Demolition on and off using your mouse. You can also assign hot keys to make adjusting your monitor even simpler. This is especially convenient when you want to quickly change your settings. To make it easy to find a profile that's right for you, profiles are arranged by game title and variables such as brightness, contrast, and dark area visibility are plotted on a radar chart. In addition, the number of times each profile has been downloaded is listed so you can gauge its popularity. 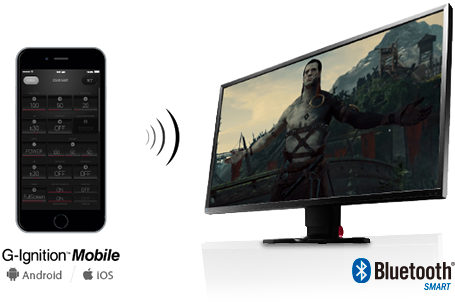 G-Ignition Mobile is a free app for the FORIS FS2735 that lets you use your smartphone like a remote control to adjust the monitor's settings. In addition, this app accesses EIZO's free G-Ignition Drive cloud service for uploading and sharing your own monitor settings and downloading presets from other gamers. Furthermore, you can connect your phone to your monitor so that whenever you receive a call, e-mail, or other communication on your smartphone, G-Ignition Mobile will post a notification icon in the lower right corner of your screen. Now you can watch with your headphones on without worrying if you can hear your smartphone's ringtone. If you prefer, colorful　and　animated　POP-UPs　of　PAC-MAN　and　other　classic　characters　from　BANDAI　NAMCO　Entertainment Inc. are available for download. Now you can watch with your headphones on without worrying if you can hear your smartphone's ringtone. G-Ignition is available on iTunes and Google Play.